The section below about stop work and recoil clicks, and an often repeated myth about the purpose of stop work, is from my page about watch movements. A mechanical watch is driven by the power stored in a spring. This is called the "mainspring" to distinguish it from other springs in the movement such as the balance spring. The inner end of the mainspring is fixed to a central shaft called the barrel arbor, the outer end of the mainspring is fixed to the inner wall of the barrel. When it is wound up the mainspring makes the barrel turn, which drives the train and the escapement, making the watch run. In almost all modern watches the mainspring is contained in a barrel that has teeth on its outside, which drives the movement directly and is thus called a "going barrel". Some watches and clocks have a fusee, a cone shaped device that evens out the torque of the mainspring. In a watch or clock with a fusee, the spring drives the fusee, which in its turn drives the movement. The arbor can turn inside the barrel, and when you wind the watch this is what happens. Winding the watch turns the arbor, which causes the spring to wrap tighter around the arbor, increasing the energy stored in the spring and the turning force on the barrel. When you stop winding a ratchet stops the arbor from turning backwards. When the mainspring is fully wound, any further turning force cannot be absorbed by the spring, instead it goes directly into driving the train. If you continue to apply pressure to the winding mechanism, this is transmitted directly to the wheel train and hence the escapement, producing excessive balance amplitude which can damage the escapement. For this reason you should stop winding a mechanical watch as soon as the sharp increase of resistance is felt at the end of winding, when the spring is fully wound. The torque (turning or twisting force) exerted by a watch mainspring is not constant as the spring unwinds. In the middle part of its range it closely follows Hooke's law; the torque is proportional the angle of rotation. But at the extremes, when the spring is either tightly wound around the mainspring barrel arbor, or almost fully uncoiled so that it is resting against the barrel wall, the variation is no longer linear and the torque can be much higher or lower as shown in the diagram here. 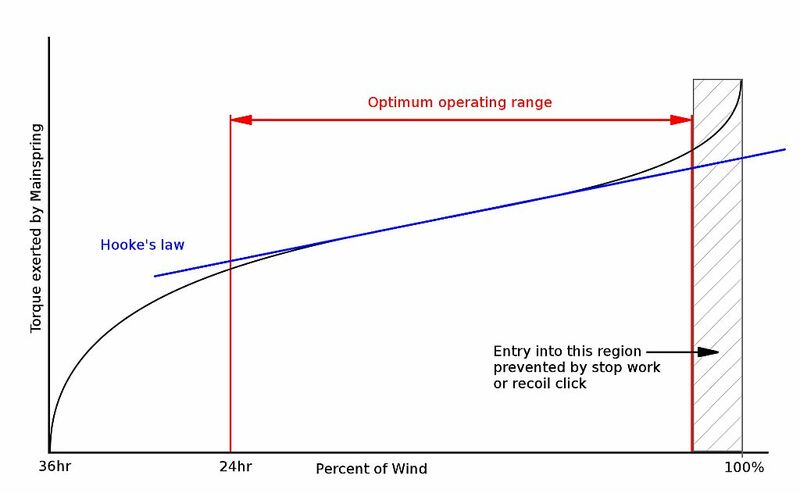 The optimum operating range for the spring is the portion shown between the red lines, avoiding the extremes of high and low torque at either end of the range. In this region the balance and balance spring can be designed to function near isochronously; that is with the same frequency despite the variation in driving torque which causes a change in the amplitude of the balance as the spring runs down. This is discussed further under Isochronism. If the spring is wound fully and tightly around its arbor, the very high torque that this creates, shown by the grey shaded region of the graph, can cause "over banking" in a lever escapement — the balance is impulsed so much that it turns further than it should and the impulse pin strikes the outside of the lever fork. This not only results in inaccurate timekeeping but can also damage the escapement. To prevent this various forms of "stop work" are used to stop the mainspring being wound tightly around its arbor. To avoid the very low torque when the spring is near fully unwound when the frequency of the balance would be affected, the spring is sized so that a manually wound watch will go for around 36 hours, on the assumption that the owner will wind it every 24 hours and hence the last portion of the unwinding outside the optimum operating range will not be encountered in normal use. Maltese cross, or Geneva, stop work limits the turning of the spring barrel so that the very high torque caused when the mainspring is wound tightly around its arbor is avoided. 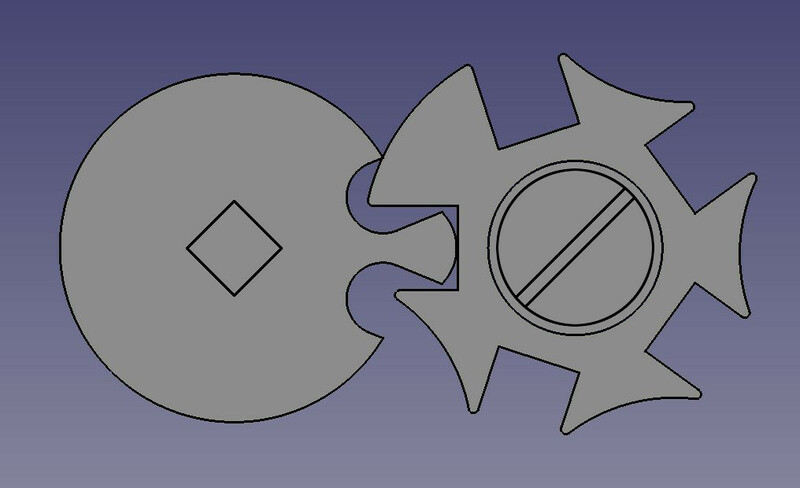 The picture here shows the general arrangement, the part to the right is supposed to resemble a Maltese cross, which is where the device gets its name from. The piece with the projecting finger sits on a square section of the arbor so that it must rotate with it. The piece shaped vaguely like a Maltese cross is attached to the spring barrel by a shouldered screw and is free to rotate. As the spring is wound and the arbor rotates relative to the spring barrel, the finger engages with each of the slots in turn and turns the cross. One of the arms of the cross is wider than the others and when this is encountered it locks against the finger piece on the barrel arbor, as is shown in the picture, preventing the spring barrel from turning any further. The same thing happens in reverse as the spring unwinds, the finger piece turns the cross until the wide arm is reached in the opposite direction and further rotation is blocked. At this point the spring barrel can turn no further and the watch will stop. This is the source of the myth discussed below, that the purpose of stop work is to prevent the watch using a weak part of the spring that would make timekeeping less accurate. However, this is a feature of the way the stop work operates; it is not its main purpose, which is to prevent the mainspring from being wound too tight. When the watch is being wound and the stop work prevents the arbor turning any further, the force of further winding is reacted against the mainspring barrel by the Maltese cross. If the owner applies further pressure to the winding mechanism, this is transmitted through the barrel directly to the wheel train and hence the escapement, producing the very effects of excessive amplitude and potential over banking that the stop work was designed to avoid. This also happens if there is a recoil click, or no form of stop work at all. For this reason you should stop winding a mechanical watch as soon as the sharp increase of resistance is felt at the end of winding. The stop work patented by IWC in 1904 in Swiss patent CH 31457 "Dispositif pour limiter le remontage des mouvements d'horlogerie à barillet" or "device for limiting the winding of a watch movement barrel" is a variation of this type of stop work called "geared stop work". Instead of the Maltese cross and finger piece, which allow only a small range of adjustments to the operation of the stop work, gears are used. This allows the number of turns that the barrel can make before it is stopped to be varied, and allows finer adjustment of the the exact point in winding at which the stop operates when the spring is being wound. Rather strangely I have never seen the IWC patented stop work, all IWC watches with stop work seem to have conventional Maltese cross stop work. It was eventually realised that the extra cost of and complexity of stop work was not justified. It was advances in spring technology that brought this about, modern springs are much longer than those used in the early days of watchmaking. A modern spring needs only to be backed off a small amount to avoid the undesired high torque when it is fully wound. Today manually wound watches usually have a simple "recoil click" instead of stop work. In watchmaking terms a click is a pawl that lets a toothed or ratchet wheel turn in one direction but blocks it from turning in the other direction. A recoil click in the keyless work is designed so that when the mainspring is fully wound, the click allows the barrel to turn backwards slightly, to "recoil", and let the mainspring uncoil a little from being fully wound. This removes the sharp increase in torque shown at the right hand side of the graph at the 100% wound position. Automatic watches, which are constantly being wound while they are worn, have a mainspring that is designed to slip in the spring barrel when it is fully wound to avoid over straining the winding mechanism. The grease used has to be the correct grease to allow just the right amount of slippage. If the grease dries out and the spring can't slip, then the automatic winding mechanism can damage itself or the barrel; another good reason for getting a watch serviced regularly. There is a common misunderstanding about the purpose of stop work such as the Maltese Cross or Geneva mechanism. It is often said that its purpose is to limit the operating range of the spring to its middle part, to prevent the spring from unwinding beyond a point where it becomes too weak and causes the watch to loose accuracy. This is not correct. The purpose of stop work is to prevent the barrel being further wound at the end of winding. This is to avoid the high torque caused when the mainspring is wound tightly around its arbor. But of course, by limiting the number of turns the barrel can make, the stop work will stop the barrel turning, and hence stop the watch, before the spring is fully unwound. This is a consequence of the design rather than its primary purpose. Rather than preventing a loss of accuracy, stopping a watch results in a total loss of accuracy, which is a great inconvenience and annoyance to the owner. As the mainspring of a going barrel (i.e. no fusee) unwinds, its torque reduces and the amplitude of the balance also reduces. With a manually wound watch this usually happens every 24 hours, between when it is fully wound and when it is run down before it is next fully wound. The effect of this variation in amplitude between fully wound and run down on timekeeping is minimised by making the balance and balance spring assembly as near to "isochronous" as possible, within the normal operating range of the mainspring. Although a watch maintains its rate less accurately, and therefore keeps time less well, if it operates with the spring run down so that it is outside the range for which the balance is isochronal, the watch is still of some use to its owner. It might lose a few minutes, but it can be wound and corrected to time when the opportunity presents itself. However, a watch that has stopped has totally lost accuracy and is useless. A stopped watch is of no use to its owner whatsoever. In fact is a positive nuisance because, in addition to winding it, the owner must then find a reference time to set the it correctly against. Today this is easy, but in earlier times, when stop work was common, it was not so easy to find a clock or a sundial. In case this discussion does not convince, I quote George Daniels (Watchmaking, p284) "If the barrel is without stop work then some form of resilient or recoiling pawl is necessary to relieve the pressure of the fully wound spring." Also in Britten (Watch & Clockmaker's Handbook, 16th edition, p38) "To avoid high torque when the mainspring is tight wound about its arbor various stop work devices can be used."